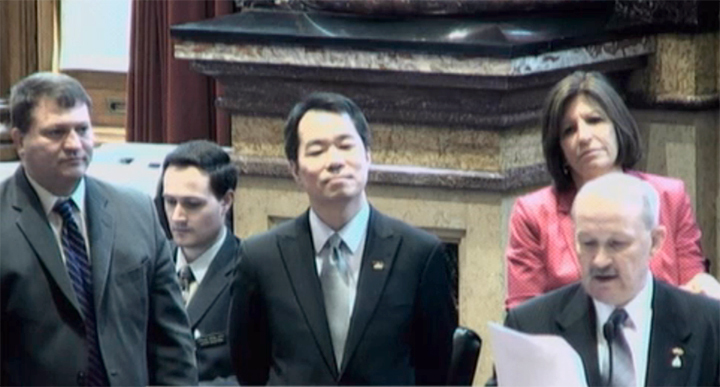 Taipei Economic and Cultural Office Director General Calvin Chen-huan Ho, center, was on hand as state Sen. Bill Dotzler (D-Waterloo) read Senate Resolution 21. 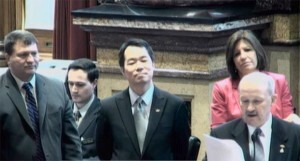 The Iowa General Assembly, through separate resolutions in the Iowa House of Representatives and the Iowa Senate, reaffirmed its relationship with the Republic of China, also known as Taiwan. Taipei Economic and Cultural Office Director General Calvin Chen-huan Ho, the official trade representative for the Taiwanese Consulate in Chicago, was on hand for the adoption of House Resolution 26 and Senate Resolution 21. He spoke briefly to the Senate following the adoption of SR 21. Iowa and Taiwan have had a long and fruitful relationship, which began more than 25 years ago. Iowa and Taiwan entered into a sister relationship in 1989. Last year, trade between the two counties increased by 50 percent over 2013.